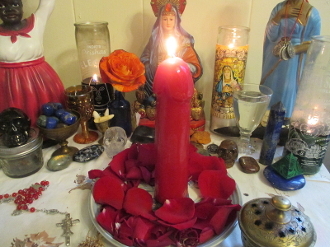 This working utilizes a hand-pured solid red phallus candle that cane be loaded and dressed to return a lover, bring sexual desire, fertility, help erectile dysfunction or fidelity. This is a 2-3 day working, depending how quickly the candle burns. I will personally load, dress and fix this candle for your specific goal. Please leave the details in the notes section of your order. * No working is guranteed. The outcome is up to your personal efforts and the decision of the spirits-as with all magic.